06th June, 2018 Family History, Latest News BBC Who Do You Think You Are? , Celebrity Family History , Celebrity Family Trees , Family History Research , MICHELLE KEEGAN , Who Do You Think You Are? Our Girl star and Coronation Street actress Michelle Keegan uncovers some exceptional women on her family tree in the episode of Who Do You Think You Are? that is broadcast tonight, Wednesday 6th June 2018 on BBC 1 in the U.K. This is a stand alone programme from the fifteenth series of the BBC’s genealogy programme. While the rest of the episodes are due to be shown later in the summer, it begins tonight with Michelle's episode to coincide with the BBC’s ‘Hear Her’ series that is celebrating the centenary of women obtaining the vote in Britain. In this show Michelle Keegan uncovers a special connection to the suffragette leader Emmeline Pankhurst when setting out to trace her Mancunian roots. She also follows a branch of her family tree to Gibraltar and back into several generations to the north of Italy. Was Twiggy's ancestor a victim of fashion? 'Twiggy', the fashion icon and model from the 1960s and who appeared in a recent BBC Who Do You Think You Are? programme on the TV, had an interesting family story to tell. Twiggy uncovered the sad truth that her ancestor's family were torn apart by illness, poverty and crime. Her search took her into the Victorian's bleakest institutions, the workhouse and the prison, something she had never heard about previously in connection with her family and on to her great-great-grandmother whose life ended in a tragic way, shopping for clothes and being killed in a "bargain sale" stampede. Twiggy whose real name was Lesley Lawson (formerly Lesley Hornby) appears in a fascinating piece in the Featured Articles on TheGenealogist. Billy Connolly next to feature on Who Do you Think You Are? Tonight on BBC1 at 9pm sees the next episode of Who Do You Think You Are? featuring legendary comedian and film star, Billy Connolly. With a family history stretching far from his native Scotland via Ireland to India in the mid 1800s, in a time of rebellion and turmoil, it’s a fascinating tale. 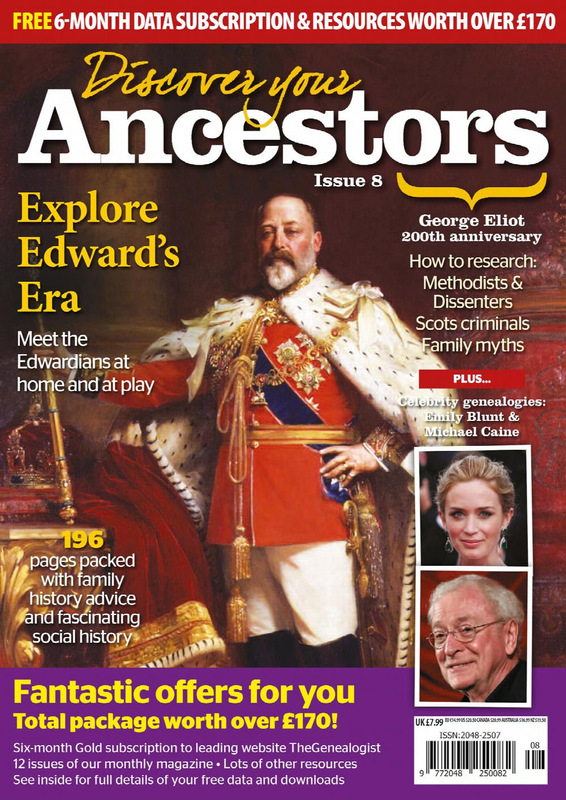 TheGenealogist has produced a preview to read before the programme in their Featured Articles pages on their website. Here you can read about Billy Connolly and also the other celebrities featured in the excellent series so far which has kept the programme as popular as ever. Billy Connolly discovers his Indian heritage in his feature on Who Do You Think You Are? As the ever popular series of Who Do You Think You Are? continues, tonight at 9pm on BBC1 sees the spotlight focus on award winning cook, writer and broadcaster, Mary Berry. The style of the series has received mixed reviews this year but may revert back to the usual style tonight as Mary has a number of interesting ancestors in her family tree. Her ancestors also appear to have had the same hard working, determined ethic that she is so renowned for. From a corset maker (also called Mary Berry) who worked and raised a family single handed, to her ancestor Robert Houghton who ran a bakery in Norwich, providing bread for the local workhouse , there's a number of interesting tales in her family history. It promises to be a good programme, will you be watching? If you'd like a taster of Mary's family history, TheGenealogist has a featured article available to view. The new series of Who Do You Think You Are? on BBC1 continues this Thursday at 9pm with star of stage and screen, Sheridan Smith. Both of her parents were musically talented and Sheridan inherited a love of singing and show business from them. In this week's programme, she is keen to find out if her family connections to the world of entertainment stretch back even further. The programme concentrates on her great great grandfather, Benjamin Doubleday and his famed banjo playing in the 1880s and 1890s. From fame and popularity he falls upon hard times as the fickle nature of show business deals him a crushing blow. However, despite circumstances conspiring against him, he carries on his banjo playing performances, into the early 1900s. If you'd like to find out more before the programme airs later this week, TheGenealogist has a special featured article on Sheridan Smith. Last night's 'Who Do You Think You Are? on BBC1 featuring Brendan O'Carroll took on a more unusual format. The star and creator of the hit comedy show 'Mrs Brown's Boys' had requested the programme to specifically look into the history of his grandfather Peter O'Carroll and his tragic murder in Dublin in 1920. The programme was able to assist Brendan in his search to find the perpetrator of the murder nearly one hundred years ago. Discovering the fact that his family was under surveillance by the security services we find how law and order was administered under British rule at the time. Brendan's grandfather was murdered by a particularly ruthless intelligence officer, Major Jocelyn Lee Hardy in his quest to find out the whereabouts of Peter's sons, known IRA supporters. What did you think of last night's show, did you prefer the format of just looking at one ancestor or do you prefer the more usual 'Who Do You Think You Are? 'style? Let us know. If you'd like to find out more about Brendan O'Carroll and his family history, TheGenealogist has a comprehensive history of him in their Featured Articles. Brendan O'Carroll offered a different style to Who Do You Think You Are? The excellent series of Who Do You Think You Are? continued last night looking into the family history of actress Tamzin Outhwaite. Concentrating on her Italian ancestry, the programme showed a fascinating tale of Adelmo Santi and his journey from Braga in Italy to join the Italian community who had settled in Glasgow in 1913. After being called back to Italy for war service in the First World War, Adelmo returns to Scotland in the 1920s with his wife and small son. He then strives to set up and develop an ice cream business, moving to Fishburn in County Durham and despite hardships and becoming interned with his son on the Isle of Man in the Second World War as an 'enemy alien', Adelmo makes a success of his business and becomes 'the richest man in Fishburn' according to local folklore. Tamzin made a widely travelled and emotional journey looking into her maternal ancestry and it made for a good and interesting programme. What do you think? Did you enjoy the programme? An emotional journey for Tamzin Outhwaite in last night's Who Do You Think You Are? Tamzin Outhwaite features in the next episode of Who Do You Think You Are? After a great episode last week featuring Brian Blessed, this Thursday 's 'Who Do You Think You Are? programme features former Eastenders actress and now star of BBC drama 'New Trick's - Tamzin Outhwaite and her family history story. Tamzin's mother, Anna, had Italian ancestry from the Santi and Gonnella families and the programme looks in-depth at their experiences moving from Italy to Britain and their hardwork and perseverence in building a life and a successful ice-cream business which gave them wealth. They endured poverty and then internment on the Isle of Man as 'enemy aliens' in the Second World War but overcame these difficulties to build a life for their families in the UK. The programme airs on Thursday 20th August at 9pm on BBC1. If you'd like to find out more, TheGenealogist has looked into Tamzin Outhwaite's family history. The series has been excellent so far. Let us know your thoughts! Tamzin Outhwaite is next in line to feature on BBC's Who Do You Think You Are? New series of Who Do You Think You Are? now underway..
What did you think of the first episode of the new series of 'Who Do You Think You Are?' featuring Julie Walters last night? With the series celebrating its tenth anniversary, the first episode got off to a strong start with a look at the Irish ancestors of Julie Walters and their struggles to get fairer rents and conditions for Irish tenant farmers, as part of the Irish National Land League, in what was known at the time as the 'Land War'. If you'd like to read a bit more, TheGenealogist.co.uk has put together a special feature looking further at Julie's ancestry. To view the special feature, visit TheGenealogist website. Hopefully the rest of the series will be just as good!